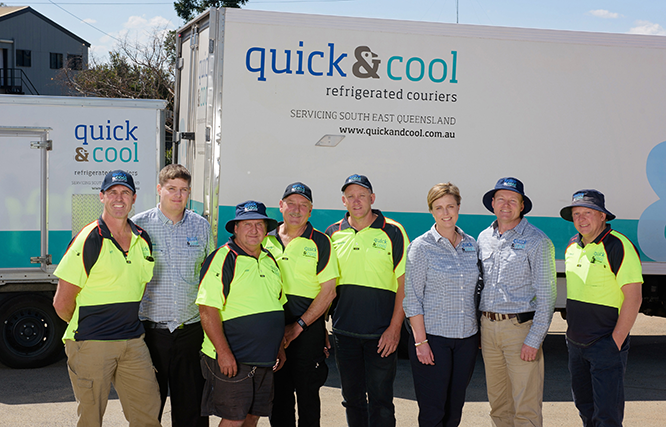 Quick and Cool Refrigerated Couriers are a family owned South-East Queensland based company with a proud 20 year history. Commencing operations under a different name with one vehicle from a Toowoomba base, we now operate regular daily services across South East Queensland meeting the needs of our diverse customer base. We have specialised in the delivery of temperature sensitive products to the food service industry and appreciate the time constraints and food safety requirements of our customers. Last mile logistics is the term that we use to describe the final, but most important leg of the delivery journey. It can be complex, time consuming and challenging for any business to get this delivery right – especially one whose focus is food, not logistics. At Quick and Cool we have built our business upon solving these challenges for our customers – delivering their product on time, at the right temperature and with a smile. We understand that our drivers and vehicles are representing our customers, each and every time we make a delivery. That is why we are committed to excellence to getting it right every time. We look forward to discussing your transport needs over the phone or using our handy online booking form. Thank you for choosing Quick and Cool. Have questions for our friendly team? Contact us!